Students at DeWitt Middle School in Ithaca walked out of classes into a cold and snowy morning. They walked out to remember those killed at Columbine 19 years ago today. On March 14, nearly the entire school body walked out. Today, it was only a small group. Today’s walkout lasted longer than the 17 minutes of the March 14 protest. Some stayed out for several hours. 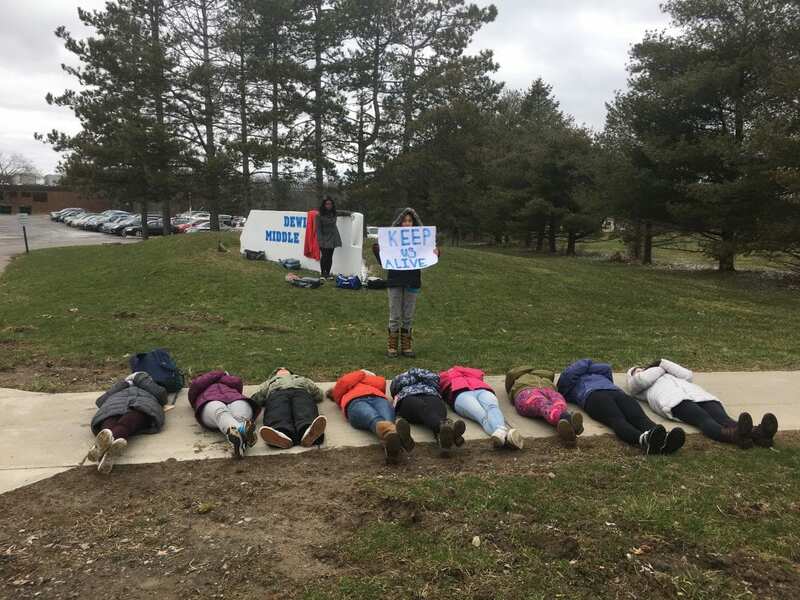 One student held a sign that read, “Keep Us Alive” while others staged a “die in” on the sidewalk along the busy street in front of the school. Jolie Babatunde, 14, is an eighth grader at DeWitt. She also walked out on March 14. They received an occasional supportive honk from cars and trucks passing by. Babatunde doesn’t think lockdown drill training will keep her safe from a school shooter. Babatunde has her parents support to leave classes to protest. She said it was worth having an unauthorized absence on her record. The DeWitt students were part of several walkouts planned at schools across the Southern Tier today.